I love that I have globetrotting friends who bring back magnets for me. 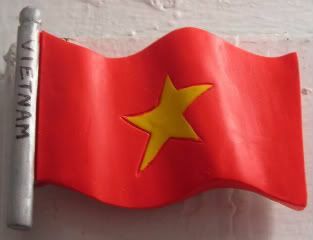 This one was brought back by a couple of friends of mine who went to Vietnam. I could have done a long magnetpost about Vietnam, but not done it any real justice. So, here we are. Seriously, the only info I have on Vietnam, is what I've learned from movies. Oh! And that really funny episode of Top Gear, where the boys roadtripped from end of the country to the other. If you haven't seen it, get thee here, now. So good! *From one of the best scenes of Princess Bride, duh. Of note is that "Vietnam" was handwritten on the magnet by these couple of friends, in case we didn't know it was a flag of Vietnam. Nope. That was *me* that wrote that on the side. Because I was afraid people wouldn't know it was Vietnam. And because at that time, a lot of my magnets had place names on it, and this one didn't. That's why I love Sharpies fine tips so very, very much.